Beautiful solid wood handcrafted heirloom quality crib made by the Amish - with a non-toxic finish. Crib is designed with three stage system that adjusts with age or size of your child. Use one piece of furniture for your child from newborn until an adult. Easily transforms from one stage to the next with the purchase of a Conversion Kit. .
All cribs meet all applicable Federal Regulations/ASTM Standards. This product requires light assembly and a how-to-assemble picture instruction manual is also included. 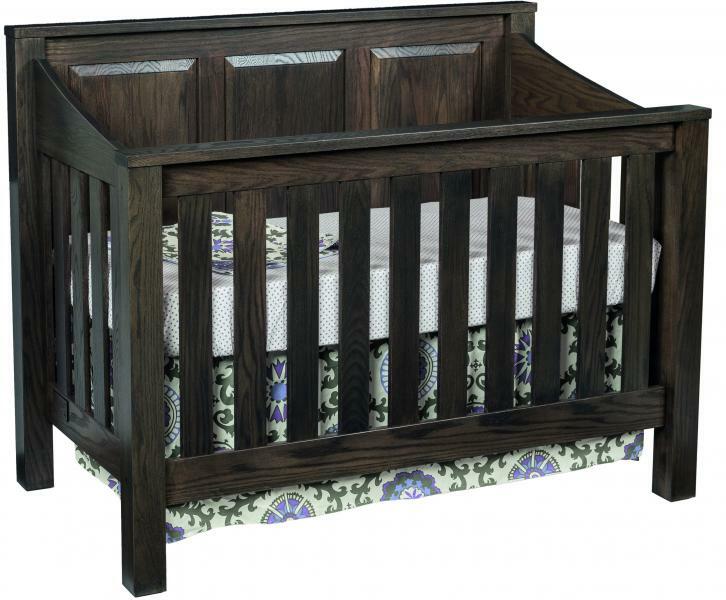 These cribs are handmade to order by the Amish, and have a 2+ month lead time. All furniture is available in your choice of Linseed Finish or Organic Stain and choice of wood. Linseed Oil or unfinished will be the least toxic option of wood finish. It will not change the natural color of the wood, but will just bring out the grain of the wood nicely. For darker color options a stain must be used. The stain and finish over it are formaldehyde free and pass child safety standards, but do have some chemicals in them. This is an oversized item with additional ship charges. Please contact us for a ship quote.